An American geographer and Russian ecologist discuss current and prospective environmental hazards precipitated by large-scale infrastructure projects on Russia's southern coast of the Gulf of Finland. 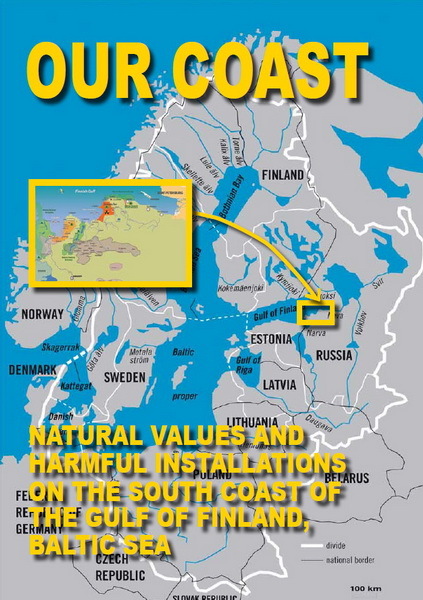 The region, investigated by both authors during the course of regular field research from 1999 to 2009, is one of the best environmentally preserved coastlines of the Baltic Sea with abundant potential greenfield sites, largely due to its closed-border-zone status during the Soviet period. A favorable location for trade also places the region under intense development pressure. The authors devote particular attention to two major developments, a multifunctional port complex (which inter alia serves as a major pipeline terminus and oil export port) and expansion of an existing nuclear power plant. 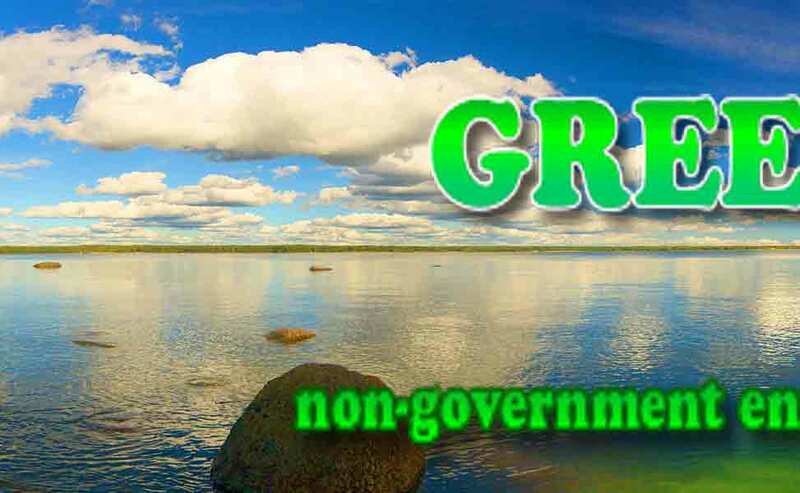 Based on extensive personal observations and government documents, they analyze the emerging environmental threat posed by these initiatives as well as the challenging political environment that discourages public participation and local involvement in spatial planning. In May 2008, Prime Minister Vladimir Putin paid a helicopter visit to the site of the Ust’- Luga port complex, currently under construction on the southern coast of the Gulf of Finland (e.g., see Kommersant, May 15, 2008, p. 1). The former President announced that, as part of efforts to diversify Russia’s outlets for energy exports, Ust’-Luga would become the pipeline terminus and oil transfer point of the Baltic [Pipeline] Transport System–2. Noting that the new pipeline would strengthen Russia’s energy security and that of its European customers as well as bolster the country’s economic potential, Putin observed that Ust’-Luga would “. . . be a very large complex, probably, the largest in the country” (BTS-2, 2008, p. 1). Fig. 1. 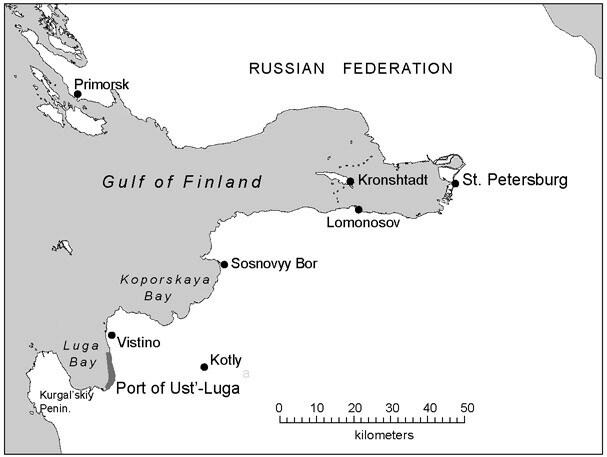 General map of the Gulf of Finland showing selected locations mentioned in the text. Yet six years earlier, this closed-border-zone territory of Russia was an almost totally undeveloped, largely pristine coastline. The purpose of this paper is to discuss the recent intensive development of the southern coast of the Gulf of Finland (SCGF) within the context of the environmental threats it poses to the region and its inhabitants. seabed pipeline entry at Arkhipo-Osipovka on the Black Sea, and the Ust’-Luga port on the southern Gulf of Finland have in each case occurred on previously undeveloped coastlines, essentially greenfield sites preserved during the Soviet period as closed border territories. In addition to Ust’-Luga, a second major project currently under way in the SCGF, and also related to energy, is the planned expansion of the Leningrad Nuclear Power Plant (LNPP). The addition of two new reactors (and ultimately as many as six) is planned both to meet the region’s projected burgeoning electricity needs as well as to provide inputs for a number of complementary industrial facilities (see below). government authorities have stepped into the vacuum, implementing increasingly largescale development in these quasi–closed border regions. expected to become an important and diversified transportation hub in the region. From a Kremlin perspective, the Baltic Sea’s role as a transport corridor for Russia’s natural resource exports and imports is strategically critical. With the completion of the Primorsk port on the northern shore of the Gulf of Finland, the Baltic Sea has already become Russia’s most important transit route for energy, accounting for 40 percent of all exports. Most decisions concerning the implementation of large-scale, strategic infrastructure projects (such as at Ust’-Luga and the LNPP expansion designed to support it) are made in Moscow. Consequently, the rapid development of the SCGF over a short timeframe might be considered a resounding state success (e.g., see Gustafson, 2000; Hanninen and Rytkonen, 2004; Nicoll and Delaney, 2007; Goldman, 2008). However, an increasing polarization of federal and local interests has emerged over specific plans for the development of the SCGF region, as federal interests are increasingly at odds with those of the local populations and their environment (ZumBrunnen and Trumbull, 2003). While the federally approved commercial investment and infrastructure development has proceeded almost unimpeded along the coast of the SCGF, small-scale, local initiatives (both business ventures, including tourism, and recreational activities) have been restricted due to the continued semi-closed, border-zone status of the region. Because small-business activity has not yet been officially permitted to develop in the border zone, the local residents have had little choice but to protect their livelihoods by accepting the new large-scale infrastructure projects. Thus, the semi-closed nature of the SCGF provides a skewed investment and social environment affording a development monopoly to the government and to the privileged, allied large quasi-private sector interests. The current Kremlin practice of appointing, rather than electing, governors further reduces state accountability to residents at the local level. Thus, a balance of federal, regional, and local interests has not been achieved in the region. Not surprisingly, public participation in the environmental planning process involving the region is almost non-existent. Only a small number of NGOs and fledgling initiative groups have been able to challenge the exclusion of local residents from the spatial planning process. federal budget expenditures on railway development and the dredging of harbor; the remainder is to come from private investors. A General Development Plan guiding construction of the port complex until 2015 has already been approved (BTS-2, 2008, p. 1). Year-round use of the port with the exception of an approximately 40-day period of ice is expected to make the port highly competitive in comparison with the largely overburdened port of St. Petersburg. The water depth of the Ust’-Luga port (16 m) and its short distance (3.7 km) to a main shipping channel in the Gulf of Finland will permit it to accept dry-cargo ships with a deadweight of 75,000 tons and liquid-cargo ships with a deadweight of 120,000 tons (ibid.). The Russian Railways company has completed construction of new rail approaches to the port (Fig. 3), and road linkages to major highway corridors also are being built. Fig. 3. Rail lines and traffic at the Ust’-Luga port complex. Terminals that are already operational (a total of four) include the necessary facilities for coal, sulfur, general cargo, and automobile–rail ferry service. Container and marine fuel oil terminals, in addition to those for the transfer of general (dry bulk) and liquid freight, are under construction. Completion of all terminals currently under construction will eventually allow for the movement of more than 20 different categories of freight, with a projected overall traffic volume of 50 million tons in 2010 (Ust’-Luga, 2008, p. 2). pointed out that the Ust’-Luga route for the Baltic Transport System-2 was selected as the “most ecological” variant of all routes proposed (BTS-2, 2008). More specifically, he was comparing the Ust’-Luga site with another proposed terminus, namely the existing oil export port at Primorsk, whose expansion would be necessary to accommodate the increased throughput and which would require additional construction of a new oil pipeline tunnel underneath the Neva River, St. Petersburg’s main source of drinking water (Trumbull, 2007). Ust’-Luga port project in 2003. The published EIA, subcontracted to the Swedish firm Scandiaconsult, concluded that the land and shoreline areas on which the port complex would be built (Fig. 4) contained a large number of rare plants that would be destroyed by construction in roughly 30 locations (EBRD, 2003, p. 13). Furthermore, dredging (required on a regular basis) and infilling of Luga Bay would destroy large areas of benthic animal habitat, and shallow-water areas used for fish spawning and feeding would disappear. Fig. 4. 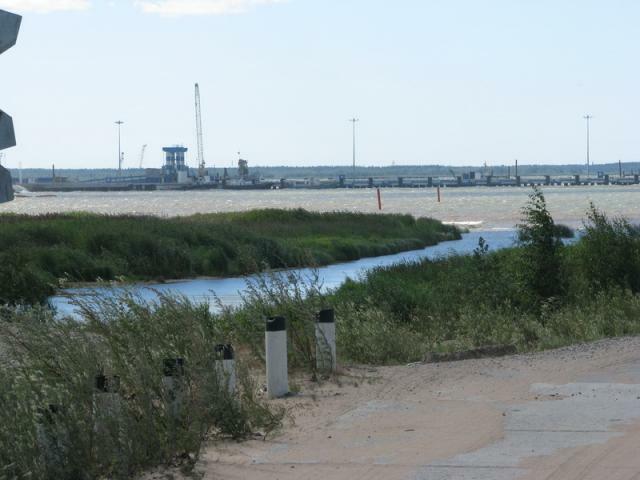 Shoreline vegetation at the mouth of the Khabolovka River and fish spawning ground in close proximity to construction of the Ust’-Luga port complex. predicts that overall traffic on the Baltic Sea will increase by 10–15 percent due to the new capacity at Ust’-Luga port. natural habitat of Luga Bay. Increased atmospheric emissions from ship traffic at the port will be compounded by those generated by road and railway transport connecting the port with its landward hinterland. (LNPP) in Sosnovyy Bor. The LNPP, which began operation in 1974, is the largest nuclear power plant on the Baltic Sea (4,000 megawatts [Mwe] capacity) with four RBMK-1000 (Chernobyl’-design) reactors (Fig. 5). A second nuclear power plant (LNPP-2) is now under construction in the vicinity of the coastline and original LNPP (Fig. 6). Fig. 6. Excavation pit (13–16 m deep) for foundation of the future LNPP-2. Gulf of Finland will not be worsened by LNPP-2, the release of large volumes of water vapor into the atmosphere may contribute to global warming. nuclear plant as well as from its expanded variant. Small and isolated releases of radioactive gases into the atmosphere have been reported over the 35-year operation of the LNPP. Spent nuclear fuel containing plutonium-239, which is hazardous to the environment for hundreds of thousands of years, continues to be stored on site and within 100 meters of the Baltic Sea. It can be assumed that the spent fuel from the LNPP (and eventually from LNPP-2) will remain on the shore of the Baltic Sea for decades after the plants close, as neither LNPP nor the Rosatom State Nuclear Energy Corporation has set aside significant funds for the unusually expensive task of decommissioning the LNPP some day. The LNPP’s original planned lifecycle has already been once extended. Perhaps most troublesome is the nearly ubiquitous absence of independent monitoring of environmental and longterm health indicators in the region. operate and may even increase their level of production as a result of new port facilities at Ust’-Luga. 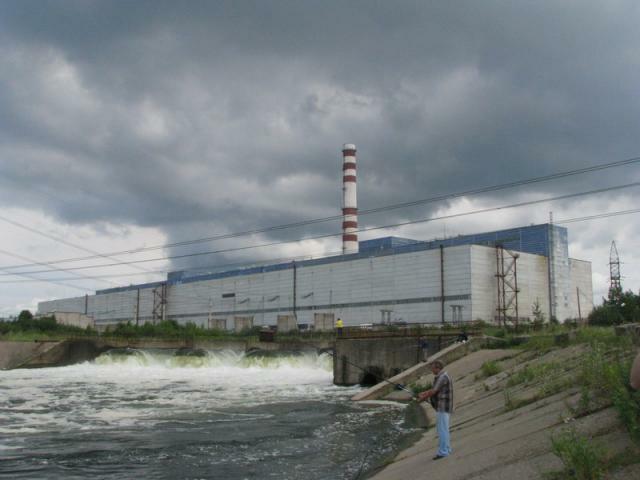 The first, ECOMET-S, processes low- and middle-level radioactive metals (e.g., in spent equipment) from LNPP, and following a modernization program began to make its smelter available for processing radioactive metal delivered from other Russian nuclear power plants and related sources, such as oil pipeline segments that have acquired low levels of radioactivity during their operational lifetimes. EKOMET-S has become the largest plant of its kind in Europe (capacity 10,000 tons/year). Although it belongs to a private company, the plant nonetheless has operated on LNPP territory since 1996. With the new Ust’-Luga port facility, plant officials expect to increase capacity and to begin importing radioactive metallic waste from other countries for processing (Henry, 2006). 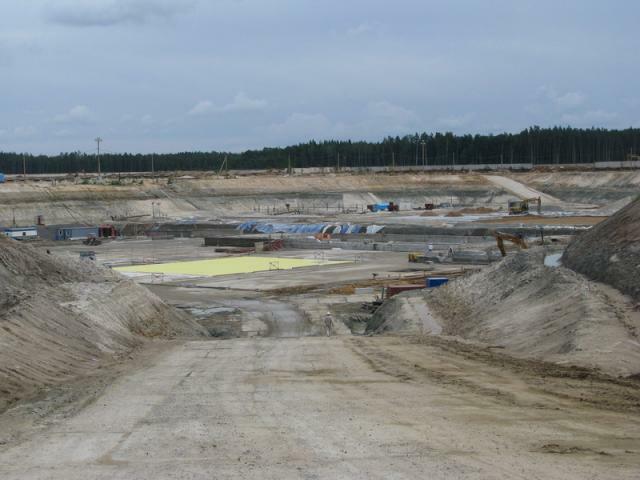 regional-level facility for storage of medium- and low-level radioactive waste from across northwest Russia, storing both solid (more than 60,000 m3) and liquid (1,200 m3) waste (Prirodnyye, 2007, p. 6). One of the most critical problems facing the RADON plant is lack of space for the disposal of new radioactive waste. impacts on the SCGF. One such project is a polycrystalline silicon chemical plant (with a projected initial annual capacity of 5,000 tons with a later expansion to 20,000). It would become the world’s largest plant of that kind at an estimated cost of $370 million (Prirodnyye, 2007, p. 5) Regional and federal authorities have already approved the project and a 40-hectare site has been selected. The plant’s power requirements (500 MWE) would be roughly half of one of the existing reactors at LNPP. An important feedstock, metallurgical silicon, is to be shipped from the Urals and also imported from Norway and Brazil. Plans for another energy-intensive, large-scale project have been resurrected as well, namely the construction of a large-scale aluminum plant on the SCGF that would take advantage of relatively inexpensive electrical power of the LNPP and its proximity to the Ust’- Luga port for importing of alumina and other raw materials and exporting finished products. Raw material for the aluminum plant is to be imported from Africa and Australia using the port of Ust’-Luga, whereupon it is processed into aluminum, and then reexported. Such projects directly enhance the prospects for an extension of the service life of the existing LNPP, as well as provide a justification for constructing the LNPP-2. The list of proposed “spinoffs” from the construction of the Ust’-Luga port and expansion of LNPP include a number of subsidiary ports along the SCGF. A relaunching of construction of a port on Batareynaya Bay, for which a widely publicized groundbreaking ceremony was held in 1997, continues to be regularly discussed. In addition, a number of other facilities are planned within the Gorkiy Harbor Area, a few kilometers north of the Ust’-Luga complex, including the Baltic Kuzbass coal terminal and a nearby roll-on/roll-off terminal. 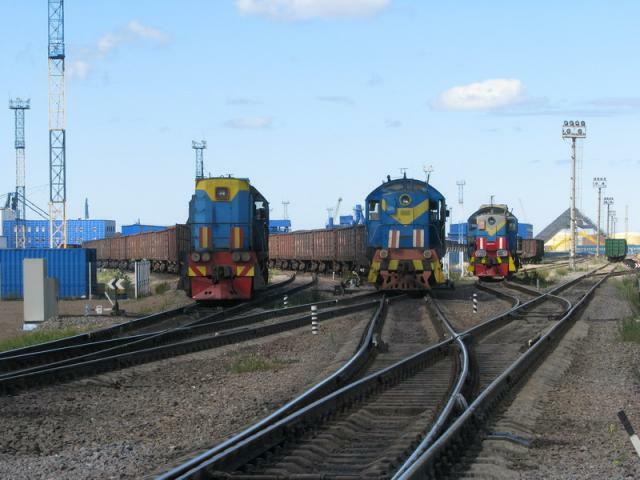 Other projects under consideration in the region include a freight terminal at Lomonosov (Fig. 1), a coal terminal at Ninas, and an enlargement of the existing Neste terminal in the vicinity of the anti-flooding protection barrier on Kotlin Island (city of Kronshtadt; e.g., see Trumbull, 2007). Also planned in the proximity of the closed border zone of the SCGF, in the direction of St. Petersburg, is a new port of Oranienbaum, where the Swedish firm Nunes AB has planned a bituminum plant. numbers of birds migrating between northern Siberia and Western Europe and Africa, contains 250 different species of birds and 750 species of vegetation. More than 40 percent of its territory is under strict protection (no human activity permitted) and the remainder is available for limited tourist and recreational use, including mushroom and berry picking, herding, and fishing. for strict protection. However, the capacity to enforce environmental protection regulations is quitte limited, and insufficient for the much greater recreational pressure that will accompany the development of Ust’-Luga and the SCGF. 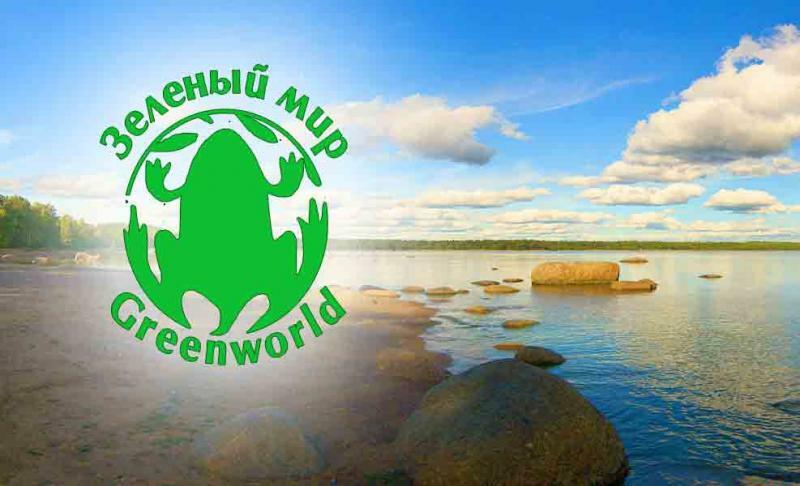 The third reserve under threat in the region, Lebyazhiy (6,300 ha), is an internationally recognized wetland reserve protected by both Russian Federation laws and the Ramsar Convention. motorized boats are permitted only in early spring and fall. As geographically closest of the three to the city of St. Petersburg, this reserve is now experiencing substantial recreational pressure. Lebyazhiy’s territory was reduced in the late 1990s when an oil port project for Batareinaya Bay was initially planned, and smaller tracts have been transferred for the construction of dachas. 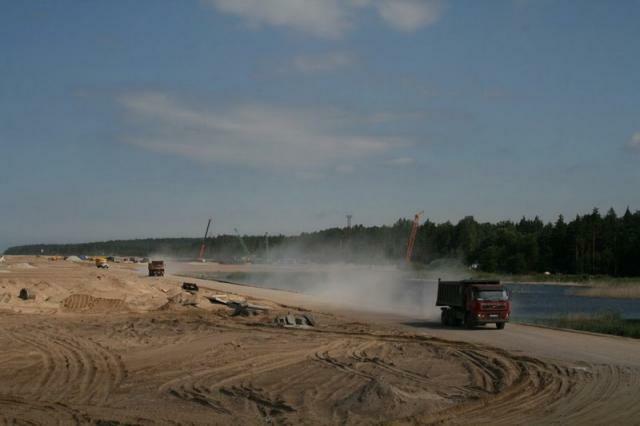 Erosion of coastal sections of Lebyazhiy is today accelerated due to dredging off the coast for sand used for infilling to create new land for development within Neva Bay (Prirodnyye, 2007; Trumbull, 2007). elevated recreational activity. Industrial-scale logging, despite being officially banned, appears to be occurring and threatens the reserves’ biodiversity. Official enforcement of measures to protect the territories of all three nature reserves remains a challenge, as efforts by local inspectors to enforce the rules in the region often are resisted by powerful commercial forces. government interests in the closed border zone of the SCGF region, local and regional planning suggestions and solutions offered by the local population are largely ignored. As such, spatial planning in the region has thus far been undertaken without genuine public participation. Fig. 7. Heavy truck traffic on access road to the Ust’-Luga port. Even the possibility of establishing an open information channel with federal leaders for sharing local concerns and preferences for the development of the region is challenging if not impossible. Within a context of “sole stakeholder involvement” (Moscow in close cooperation with large commercial interests), the prospects for the region’s balanced economic and social development of the region are greatly diminished. This situation undermines considerably the chance for a favorable outcome in terms of even pursuit of a sustainable approach to the region’s development. An official roundtable event at the annual Day of the Baltic Sea conference in St. Petersburg in 2007 included a revealingly stated demand by the participants that mechanisms be introduced to ensure public access to appropriate information related to planned and implemented infrastructure development in the region. achieved some successes, efforts to strengthen public participation can be stymied by emergence of government NGOs (GONGOs) that misrepresent the preferences and values of the public (Prirodnyye, 2007, p. 15) as well as government tactics to discreetly hold public hearings before organized public participation can materialize. More generally, public hearings related to infrastructure development on the SCGF have largely been formalities, performing more of an informational than consultative role. In the case of a hearing conducted for the Ust’-Luga port complex, only 123 people attended despite the very large scope of the project and significant environmental impact on the SCGF (EBRD, 2003). 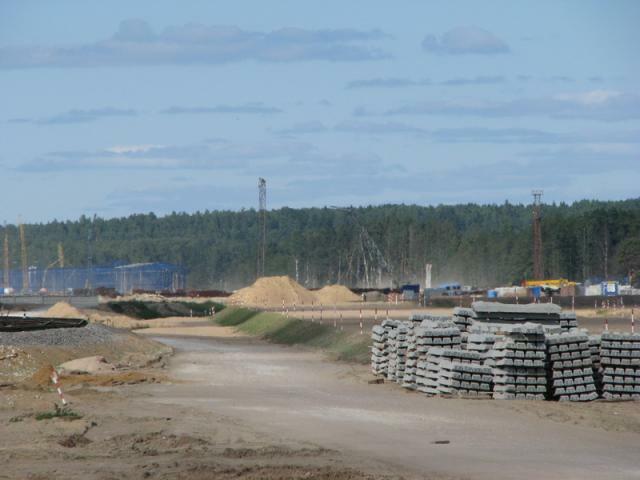 Similarly, public hearings held for the planned construction of compressor station and entry point of the proposed North Stream gas pipeline in the closed border area of Portovaya Bay in Leningrad Oblast, arguably the most visible future coastal infrastructure project in Russia today, have widely been viewed by environmentalists as cursory and ineffective (Zernova, 2009). pipeline in the Lake Baykal region (e.g., Melikova, 2006). Similarly, illegal private home construction on the Curonian Spit in Kaliningrad—a UNESCO World Heritage site farther west on the open Baltic (Raguzina, 2008)—and countless rigged auctions and unauthorized sales of coastal property on the previously public recreational shoreline in the vicinity of St. Petersburg demonstrate that without effective public participation in spatial planning at all levels, conditions bode poorly for the sustainable development of Russia’s coastal areas. Alimov, A. F. and S. M. Golubkov, “Izmeneniye v ekosistemakh vostochnoy chasti Finskogo zaliva (Changes in the Ecosystems of the Eastern Gulf of Finland),” Vestnik Rossiyskoy Akademii Nauk, 2008, 78, 3:223–224. 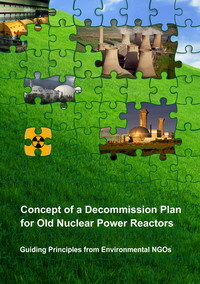 Bodrov, Oleg et al., [Authors: Please list all authors if total is 6 or fewer] Kontseptsiya plana vyvoda iz ekspluatatsii energoblokov AES, vyrabotavshikh proyektnyy resurs (Concept of a Decommissioning Plan for Nuclear Power Plants That Have Outlived Their Planned Resources). 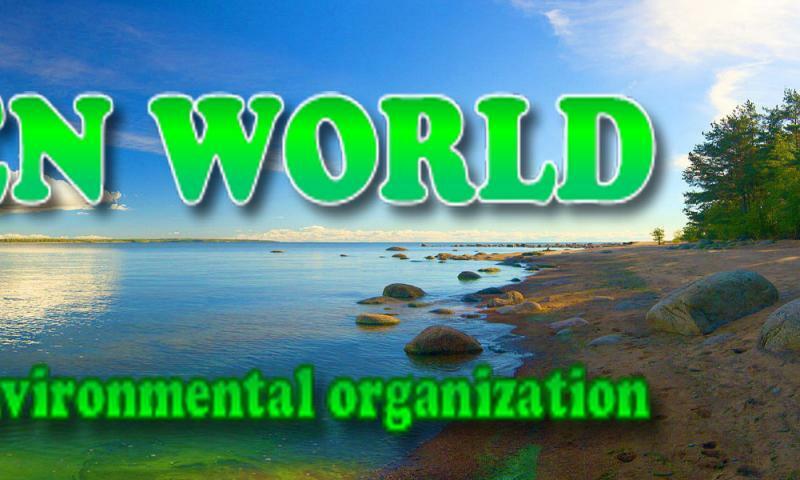 St. Petersburg, Russia: Green World, 2008. “BTS-2 idet v Ust’-Lugu (BTS-2 Is Coming to Ust’-Luga),” in Ust’-Luga, Strategicheskiy vybor Rossii: Korporativnaya gazeta Gruppy Kompanii Ust’-Luga (Strategic Choice of Russia: Corporate Paper of the Group of Companies Ust’-Luga), No. 1, August 2008. Chistov, Andrey, “Chinovniki obogashchayutsya na nezakonnoy prodazhe uchastkov zemli deystvuyushchego zakaznika ‘Polyana Bianki’ (Officials Enrich Themselves through the Illegal Sale of Land Parcels on the Operating Reserve ‘Polyana Bianki’),” Pomoika.org, January 27, 2009 [http://www.pomoyka.org/index.php?part=news&id=2869]. Ericson, Richard E., “Eurasian Natural Gas Pipelines: The Political Economy of Network Interdependence,” Eurasian Geography and Economics, 50, 1:28–57, 2009. European Bank of Reconstruction and Development (EBRD), “Ust’-Luga Port Development Project Multi-purpose Terminal Environmental Impact Assessment: Executive Summary.” Göteborg, Sweden: Scandiaconsult, 2003 [http://www.ebrd.com/projects/eias/balusten.pdf]. Fish, M. Steven, Democracy Derailed in Russia: The Failure of Open Politics. Cambridge, UK: Cambridge University Press, 2005. Fortescue, Stephen, “The Russian Aluminum Industry in Transition,” Eurasian Geography and Economics, 47, 1:76–94, 2006. Goldman, Marshall, Petrostate: Putin, Power, and the New Russia. Oxford, UK: Oxford University Press, 2008. Gustafson, Thane, Capitalism Russian-Style. Cambridge, UK: Cambridge University Press, 2000. Hanninen, Saara and Jorma Rytkonen, Oil Transportation and Terminal Development in the Gulf of Finland. Espoo, Finland: VTT Technical Research Centre of Finland (commissioned by the Ministry of the Environment, Finland), 2004. [http://www.vtt.fi/inf/pdf/publications/2004/P547.pdf]. “HELCOM Report Shows a 12% Increase in Ship Accidents in the Baltic,” Helsinki Commission, press release, June 12, 2009 [http://www.helcom.fi/press_office/news_helcom/en_GB/Ship_accidents_2008_report/]. Henry, Laura, “Shaping Social Activism in Post-Soviet Russia: Leadership, Organizational Diversity, and Innovation,” Post-Soviet Affairs, 22, 2:99–124, 2006. Kondrat’yev, Sergey, Formirovaniye vneshney nagruzki na vodoyemy: Problemy modelirovaniya (Formation of External Loads on Reservois: Problems of Modeling). St. Petersburg, Russia: Nauka, 2007. “Kozmino Bay Is Approved to Be the ESPO Pipeline Terminal Final Site,” March 12, 2007 [http://www.wwf.ru/resources/news/artiacle/eng/print/2875]. “Kurgal’skiy i Kotel’skiy zakazniki prodolzhayut nezakonno vyrubat’ (Kurgal’skiy and Kotel’skiy Reserves Continue to Be Illegally Cut,” Pomoyka.org, July 28, 2009 [http://www.pomoyka.org/index.php?part=&begin=6&id=1772]. Melikova, Natalya, “Hands Off Baikal!,” Nezavisimaya Gazeta, April 27, 2006, 1, 3 (translated in Current Digest of the Post-Soviet Press, May 24, 2006, 4–5). Nicoll, Alexander and Jessica Delaney, “Baltic Sea Security: Pipeline Plan Raises Concerns,” International Institute for Strategic Studies Strategic Comments, 3, 8:1–2, October 2007. “Obshchestvennyy ekologicheskiy sovet pomozhet naiti kompromis s naseleniyu i munitsipal’nym vlastiyam (Public Environmental Council Will Help to Find a Compromise between the Population and Local Authorities),” Pomoyka.org, February 2, 2009 [http://www.pomoyka.org/index.php?part=news&id=2930]. Petrostat, Leningradskaya oblast’ v 2007 godu: Statisticheskiy yezhegodnik (Leningrad Oblast’ in 2007: Statistical Yearbook). St. Petersburg: St. Petersburg Branch, State Statistical Committee (Petrostat), 2008. Prirodnyye tsennosti i opasnyye proizvodstva izhnogo berega Finskogo zaliva (Natural Values and Dangerous Installations on the Southern Coast of the Gulf of Finland). Sosnovy Bor, Russia:Green World, 2007, 16 pp. “Radioaktivnyy skvoznyak iz okna v Evropy (Radioactive Draft from a Window on Europe),” Baltiiskiy Vestnik, 103, February 12, 2009. Raguzina, Galina, “Kurshskaya Kosa: Peremeny k luchshemu (Curonian Spit: Changes for the Better),” Ekologiya i Pravo, 27, 21–23, March 2008. Sagers, Matthew J., “The Regional Dimension of Russian Oil Production: Is a Sustained Recovery in Prospect?,” Eurasian Geography and Economics, 47, 5:505–545, 2006. Sagers, Matthew J., “Developments in Russian Gas Production since 1998: Russia’s Evolving Gas Supply Strategy,” Eurasian Geography and Economics, 48, 6:651–698, 2007. Sagitov, R. and P. Merriman, “Round Table Resolution: NGOs Co-operation in the Baltic Sea Region,” in VIII International Environmental Forum Baltic Sea Day, St. Petersburg, 2007 [http://www.helcom.fi/press_office/news_baltic/en_GB/BSD2007_Resolution_NGOs/?u4.highlight =Ust’-Luga]. Stern, Jonathan, The Future of Russian Gas and Gazprom. Oxford, UK: Oxford University Press, 2005. Trumbull, Nathaniel, “Pressures on Urban Water Resources in Russia: The Case of St. Petersburg,” Eurasian Geography and Economics, 48, 4:495–506, 2007. “Ust’-Luga 2008: Etapy bol’shogo puti (Ust’-Luga 2008: Stages of a Long Journey),” in Ust’-Luga, Strategicheskiy Vybor Rossii: Korporativnaya Gazeta Gruppy Kompanii Ust'-Luga (Ust’-Luga, Strategic Choice of Russia: Corporate Paper of the Group of Companies Ust’-Luga), 2, December 2008, 1–2. “Ust’-Luga: Strategicheskaya stroyka s gosudarstvennym podkhodom (Ust’-Luga: Strategic Construction with a State Approach),” July 23, 2009 [http://bts2.ru/news/data/ic_2/47/]. “Vyrubki v Kotel’skom zakaznike prodolzhayutsya (Timber Cutting in Kotel’skii Nature Reserve Continues),” Pomoyka.org, January 28, 2009 [http://www.pomoyka.org/index.php?part=news&id=2875]. Zimin, Vladimir, “Luga Bay: Ports against nature,” in Baltic Hot Spots–Hazards and Possibilities for the Baltic Sea Region. [Authors: Please indicate city of publication)]: Coalition Clean Baltic, 2002 [http://www.ccb.se/spots.html]. Zernova, Lina, “Nord Stream snimayet voprosi (Nord Stream Tables the Questions),” Ecopravo, 31, 1:12–14, 2009. ZumBrunnen, Craig and Nathaniel Trumbull, “Environmental Policy Challenges,” in Stephen K. Wegren, ed., Russia’s Policy Challenges: Security, Stability, and Development. Armonk, New York: M. E. Sharpe, 2003, 250–275. Copyright © 2009 by Bellwether Publishing, Ltd. All rights reserved.